South Buffalo Springs Animal Hospital is here for you when you need us. We promise to be there to care for your loved ones when you need it most. We are a full service, state of the art animal hospital with walk in service. Appointments are also available using our very own smart phone application. And we are on call 24 hours a day for emergencies. No matter what time of day we ensure the highest quality attention and care for each individual family friend. Our state of the art facility ensures the very best in care for your loved one. 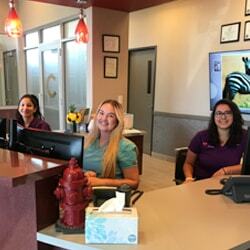 We offer endoscopic and laproscopic procedures, preventative and emergency dental care, full radiology services and the best in critical and emergency care. Our highly trained veterinarians will ensure your loved one receives the most advanced care when they need it the most. Here at South Buffalo Springs we believe in preventative medicine and stress the importance of daily care weekly maintenance, monthly grooming, and annual screening. Our “Pet Partner” integrated system ensures your loved one’s care is personal and, importantly, simple for your busy life. Not only are you able to schedule your own appointments through our Custom App, you can also set up spa day reminders, grooming notifications, and your very own life coach consult. We strive to keep your loved ones in good health as long as possible. And when it is time for you to leave town, you can be rest assured that we will take care of your loved one. We offer only the best of luxury boarding suites featuring beautiful tempered glass cages, monitored and cared for by our staff 24 hours a day.